High up in the mountains stands the beautiful CRYSTAL RAINBOW CASTLE, the starting point for all the rainbows in the land. Every room is filled with fun, magic and beautiful colors. And if you climb to the very top of the castle, you can watch as all the rainbows shoot forth and soar across the horizon, lighting up the entire sky! 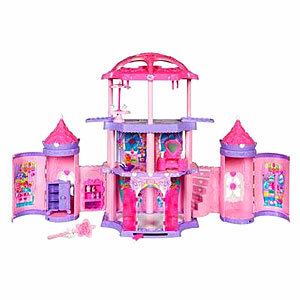 Pretty pink-and-purple castle playset is full of surprises! Wave the magic wand over the castle doors, then watch the front doors open as the castle magically grows to three stories high! Once inside, you'll find plenty of nooks and crannies to help your ponies (sold separately) feel right at home! Place a pony on the dance floor and slide the lever back and forth to make her dance! Ponies can retreat to the second floor bedroom, or take in the view on the third floor terrace! 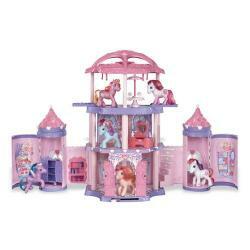 Plus, when you open up the towers, you'll find a lovely dressing room and dining room for your ponies to explore! Castle comes with table with umbrella, vanity, punch bowl, ladle, 2 glasses, 3 canisters with removable lids, 3 perfume bottles, 2 dishes of ice cream, 2 spoons, china cabinet and magic wand. The Crystal Rainbow Castle is full of magic, enchantment and new discoveries. Girls can make the castle magically expand from one story to three stories! Also, watch the pretty ponies (sold separately) as they "dance" and glide across the magic dance floor. 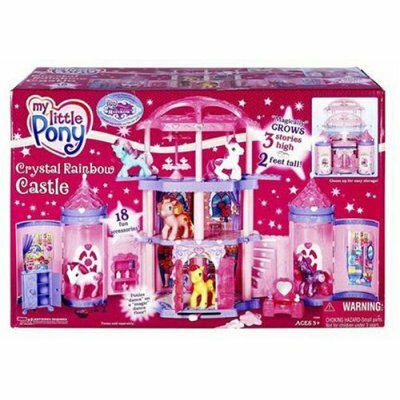 Castle comes with loads of fun accessories, including table, umbrella, vanity, punch bowl, ladle, 2 glasses, 3 canisters with removable lids, 3 perfume bottles, 2 dishes of ice cream, 2 spoons, china cabinet and "magic" wand. Requires 2 "AA" batteries (not included). Ages 3 and up. My Little Ponies sold separately.